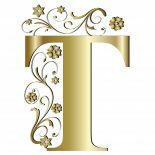 The five most frequently used and abused terms encountered when browsing Internet listings for trivets are vintage, antique, early, scarce and rare. Just because a Seller describes a trivet with one of these terms doesn’t make it necessarily so! 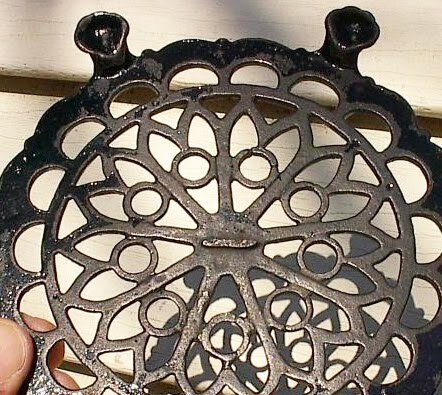 Unless the trivet’s description and images leave no doubt of it’s age and condition, it’s up to the buyer to further evaluate a trivet before bidding. Not being able to physically examine the trivet presents its own unique challenges. 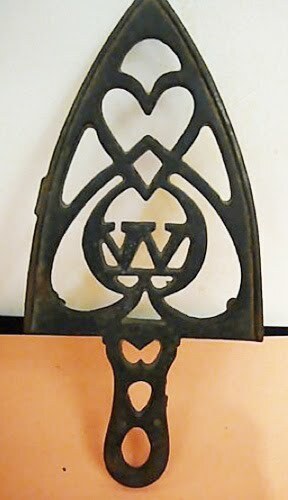 Many of us have experienced winning an Internet auction, only to receive the trivet and realize it’s damaged, or worse yet- a reproduction. How can you increase your chances of success in buying trivets? The answer is by recognizing the characteristics of an early casting. The 1990 book Trivets And Stands has an excellent section on early Trivet Designs on pages 85-95. And my article Antique ID on the PITCA website provides additional information on differentiating newer from older castings. 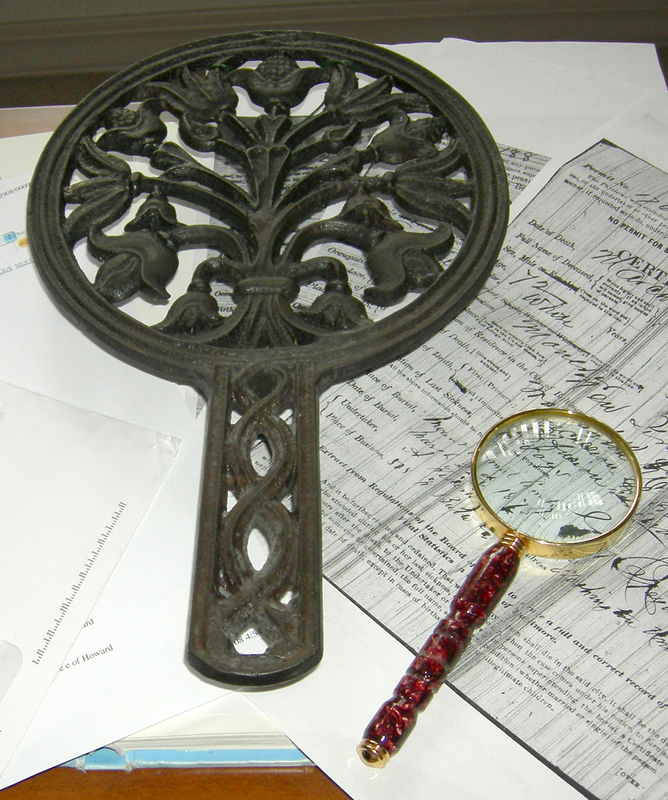 Once you’ve identified an interesting trivet, the next step is to evaluate it for any damage. Some sellers may not recognize a hairline crack or missing design feature. Enlarging the photo will help to detect any imperfections, and your computer can assist! On eBay you can mouse over the image or click to enlarge; on other internet auction sites there is usually some method provided. This eBay auction featured a Lantz style trivet described as antique and in good condition, free of cracks. And although it does exhibit a pronounced wedge mark (making it an early trivet, probably 1850s), the next step is to check for cracks. The circles are the most fragile area of this particular design. Holding down your computer’s Control (ctrl) key while moving the center mouse wheel forward will enlarge the image; moving the wheel backwards will return the image to its original size. Be sure to examine all areas of the trivet carefully. If you see something suspicious in one photo, look at that same area in another view. 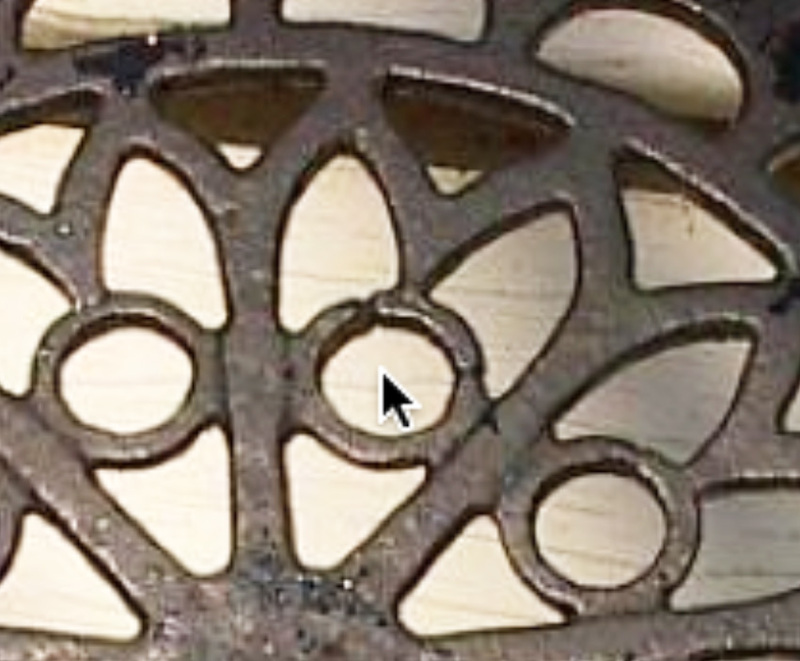 Just as I suspected; this trivet has several cracked circles. Sometimes the problem is simply that the auction photo is too dark, hiding imperfections or valuable information like a design element, a cast mark or a signature. If you have access to Adobe Photoshop or a similar application, take a screenshot of the auction photo and then use Image Adjustment to improve the exposure. By adjusting the brightness and contrast previously hidden details may become evident. The surface details and left edge gate mark become much better visualized, and there don’t appear to be any cracks in the casting. 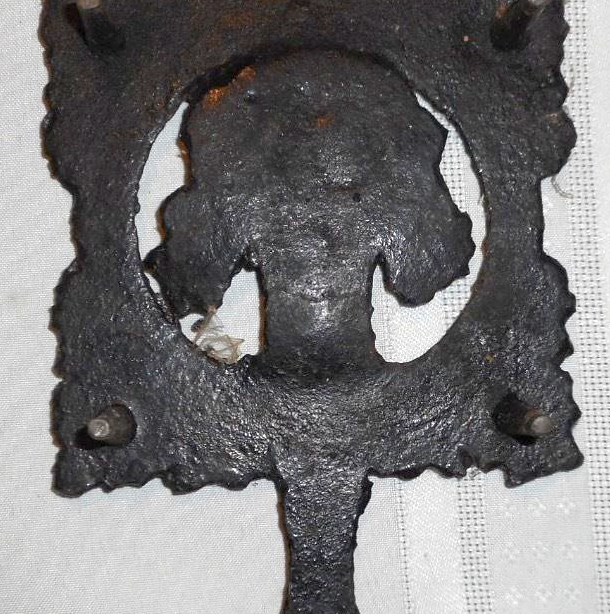 Trivets used as sad iron stands were vulnerable to heat-related expansion, contraction (and cracking). The neck area of the Jenny Lind trivet is thinner and vulnerable, so that’s an area I always scrutinize first. 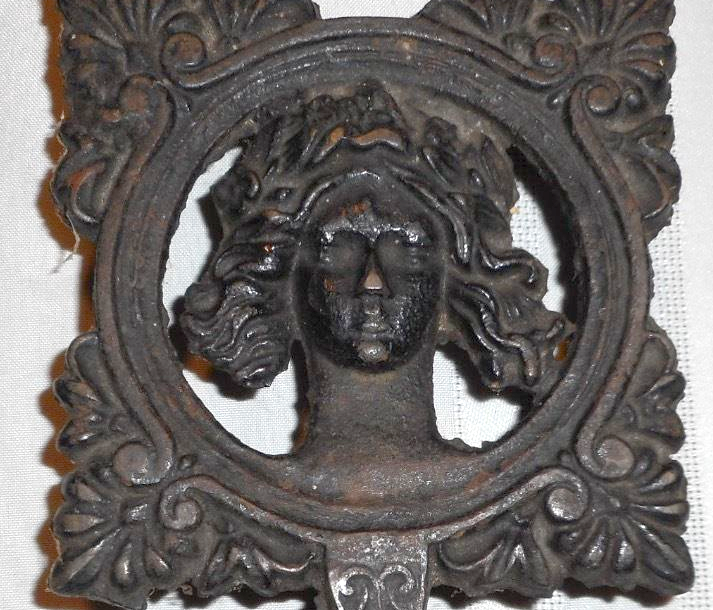 The front and back of these auction photos were very dark, so I zoomed into the trivet images and made screenshots on eBay. Then I took them to Adobe Photoshop. Keep in mind I’m limited by the original photo resolution. Adjusting the contrast reveals a crack in the lower front neck. The adjusted reverse image confirms a higher, second crack as well. Like many other collectors, I’ve been known to purchase a damaged trivet, as long as it’s a rare design. It remains in my collection until I have the opportunity to upgrade to a better example. In that way I’m constantly improving the quality of my collection. Good luck and happy collecting! 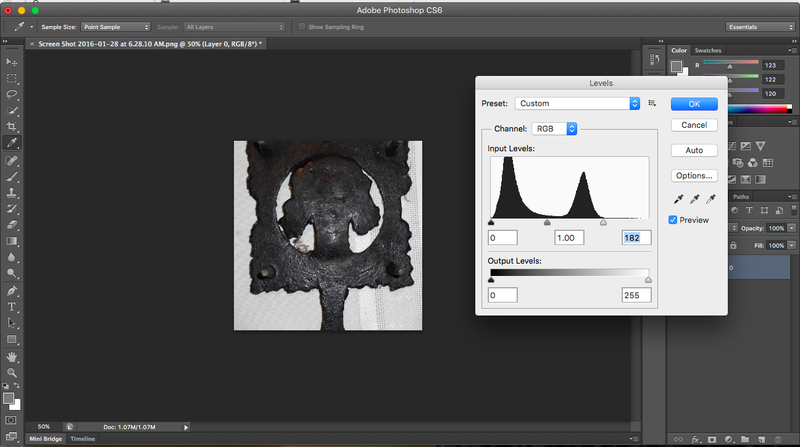 This entry was posted on January 27, 2016 by Lynn Rosack in Collecting Basics and tagged Adobe Photoshop, cast iron, gate-mark, Jenny Lind trivet, Lantz, stress crack, wedge-mark.